What is your favorite boxing movie? My favorite boxing movie isn’t Rocky or The Fighter, although they are both fantastic. 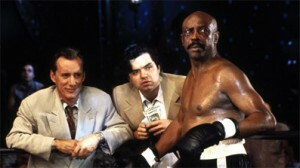 My favorite boxing movie of all time is Diggstown starring James Woods and Louis Gossett, Jr. The story goes like this – Gabriel Caine (Woods) has just been released from prison when he sets up a bet (and a con) with a business man. The business man owns most of a boxing-mad town called Diggstown. The bet is that Gabe can find a boxer that will knock out 10 Diggstown men, in a boxing ring, within 24 hours. “Honey” Roy Palmer (Gossett, Jr.) is that man – although at 48, many say he is too old. In one of my favorite scenes, “Honey” Roy Palmer has taken a Rocky style beating. He is practically knocked out, and Gabe being fearful for his friend throws in the white towel. Before it lands in the ring, Palmer heroically catches it and throws it out of the ring. He then stands up and goes “broken leg Daniel San” on his competitor and wins the fight. Everyone is talking about Amazon.com – the e-commerce giant that seemingly owns the entire town and now have entered into B2B with AmazonSupply.com. Many companies talk about competing directly with Amazon through a specialized product set (think Blinds.com and Diapers.com – okay don’t think about Diapers). Staples on the other hand did something different. They caught and threw the white towel out of the ring, stood up, and are prepared to make this a real fight. What’s cool about this, is that the Staples b2b e-commerce marketplace competes directly not just on product, but on business model too. Staples Inc. is on the verge of greatly expanding its online business-to-business and consumer product offerings to more than 1 million SKUs. That’s up from about 200,000 today and would include categories such as power tools, medical devices and garden supplies as it prepares to go far beyond its core office supplies market and begin channeling sales from third-party sellers as well as handling its own sales on the chain’s redesigned e-commerce sites, says Faisal Masud, executive vice president, global e-commerce. Staples is B2B and B2C, but mainly B2B. They are the number 2 online commerce site, only behind Amazon.com. They already have a significant B2B and B2C site that has fantastic functionality(staples.com, quill.com, staplesadvantage.com). But now they are launching a marketplace not just to combat their office supply market share from AmazonSupply.com, but to take on their own market share on non-office related products. And this is not going to be the end of it. There are many leading B2B organizations that see b2b marketplaces as part of their future – expanded products, focus on supply chain, delivery and drop-ship, and deep vendor relationships will enable them to do this and maybe even do this really, really well. B2B is not just a re-purposing of B2C. To look at what B2B is doing, we DO NOT simply look at the past of B2C. We are starting to see innovation that retailers never even thought of. Can you tell I am a tad bit excited? I am, because this is just like the 80s and 90s in ERP. It is the start of wide-spread change and of business transformation. Another of my favorite scenes in Diggstown is the very end, when through the entire 10 fights Gabe was unable to say the right thing to motivate Palmer. After the fight is over and the stadium has cleared, Gabe and Palmer are talking by themselves. Gabe says to Palmer “What you did today Roy, it couldn’t be done”, to which Palmer says “Now you motivate me?!?!”. If you are looking at B2B E-Commerce you have found that there are not a lot of good models or examples out there. The people who talk about it are not very motivating or not very knowledgeable about actual B2B. However I promise you this, once you are done and the fight is over, you will realize what you did couldn’t have been done. P.S. Wow, I sure stretched the Diggstown example to fit here. A bit over dramatic too. Sorry.